Jordan Alexander Spieth (born July 27, 1993) is an American professional golfer on the PGA Tour and former world number one in the Official World Golf Ranking. He is a three-time major winner and the 2015 FedEx Cup champion. In April 2016, Time magazine named Spieth to its list of the "100 Most Influential People", noting that he "exemplifies everything that's great about sports." Spieth's first major win came in the 2015 Masters Tournament, when he shot a 270 (−18) and pocketed $1.8 million. He tied the 72-hole record set by Tiger Woods in 1997 and became the second youngest golfer (behind Woods) to win the Masters. He then won the 2015 U.S. Open with a score of 5-under-par. He was the youngest U.S. Open champion since amateur Bobby Jones in 1923. He followed up with a win in the 2015 Tour Championship, which clinched the 2015 FedEx Cup. Two years later, Spieth won his third major at the 2017 Open Championship, by three shots at 12 under-par. Spieth was born in 1993 in Dallas, Texas, to Shawn Spieth and Mary Christine (née Julius) Spieth. He attended St. Monica Catholic School and graduated from Jesuit College Preparatory School in 2011. He learned to play golf at Brookhaven Country Club. In 2009 and 2011, Spieth won the U.S. Junior Amateur and joined Tiger Woods as the tournament's only two-time winners. Before turning 18 in July 2011, he was No. 1 in the AJGA Golf Rankings, which promotes the best junior golfers in the world. He finished second in the 2008 and 2009 Junior PGA Championship. The American Junior Golf Association named him the Rolex Junior Player of the Year in 2009. Spieth accepted an exemption to play in the PGA Tour's HP Byron Nelson Championship in 2010. It was the event's first amateur exemption since 1995. The tournament's previous exemptions had included Trip Kuehne in 1995, Justin Leonard, and Woods in 1993. He made the cut, becoming the sixth-youngest player to make the cut at a PGA Tour event. Spieth was tied for seventh place after the third round, and finished the tournament in a tie for 16th place. He was offered another exemption into the tournament in 2011, when he again made the cut and finished in a tie for 32nd. Spieth played college golf at the University of Texas. Spieth was a member of the 2011 Walker Cup team and played in three of the four rounds; he halved his foursomes match and won both singles matches. In his freshman year at Texas, Spieth won three events and led the team in scoring average. He helped his team win the NCAA championship, was named to the All-Big 12 Team, Big 12 Freshman of the Year and Player of the Year, and was a first-team All-American. In 2012, Spieth earned a spot as an alternate in the U.S. Open after Brandt Snedeker withdrew from the tournament; he tied for 21st and was the low amateur. He became the number one amateur in the World Amateur Golf Ranking after his performance in the U.S. Open and Patrick Cantlay's decision to turn professional. In 2012, after failing to advance to the Final Stage of PGA Tour qualifying school, 19-year-old Spieth turned professional midway through his sophomore year at Texas. He partnered with Under Armour for sponsorship in January 2013 and with BioSteel Sports Supplements in March. In the 2013 season, Spieth played in his first tournament in January, where he missed the cut by two strokes at the Farmers Insurance Open at Torrey Pines. In March, Spieth made three cuts, finishing tied for second at the Puerto Rico Open and tied for seventh at the Tampa Bay Championship. He earned Special Temporary Member status in March, which allowed him unlimited sponsor exemptions; non-members are limited to seven exemptions per season. He notched another top-10 finish in April at the RBC Heritage, a tie for ninth. On July 14 (about two weeks before his 20th birthday) Spieth won the John Deere Classic on the fifth hole of a three-way, sudden-death playoff against defending champion Zach Johnson and David Hearn. He became the fourth youngest PGA Tour winner and the first teenager to do so since Ralph Guldahl won the Santa Monica Open in 1931. Spieth holed out from a greenside bunker on the 72nd hole to make the playoff. With the victory, Spieth was granted full status as a PGA Tour member and became eligible for the FedEx Cup, entering in 11th place in the standings. It also earned him entry into the next three majors: the 2013 Open Championship, PGA Championship, and 2014 Masters. Five weeks after his first victory, Spieth played the Wyndham Championship, where he lost in a playoff to Patrick Reed. Spieth shot a final round 62 in the Deutsche Bank Championship, vaulting him into a tie for fourth. Just two days later, captain Fred Couples selected Spieth for the United States squad in the 2013 Presidents Cup. On September 27, 2013, he was named PGA Tour Rookie of the Year. At the end of the 2013 season, he was ranked 10th on the PGA Tour money list and 22nd in the Official World Golf Ranking. Spieth made his Masters debut in April and shared the 54-hole lead with Bubba Watson. During the final round, Spieth at one point was the stand-alone leader by two strokes and in position to become the youngest Masters champion in history; Tiger Woods holds the record at age 21. But Watson retook the lead heading into the second nine and never relinquished it. Spieth finished in a tie for second with Jonas Blixt, becoming the youngest runner-up in Masters history. Spieth ended the tournament with no scores above even-par (72) in any of his rounds. His finish moved him into the top 10 in the world rankings for the first time. Following the PGA Championship, Spieth earned selection to the 2014 Ryder Cup team, becoming the youngest American to play in the matches for 85 years since Horton Smith in 1929. In November, Spieth won his second tournament as a professional at the Emirates Australian Open on the PGA Tour of Australasia; in the final round he shot a course-record 63 to win the title by six strokes. A week later, he completed consecutive victories, winning the Hero World Challenge in Florida. He won the tournament wire-to-wire and in doing so set a new tournament scoring record of 26-under-par. On March 15, Spieth won the Valspar Championship in a three-way playoff with Patrick Reed and Sean O'Hair. He secured his victory on the third extra hole by sinking a 30-foot birdie putt. The win moved him to 6th in the Official World Golf Ranking. A runner-up finish at the Valero Texas Open moved him to a career-high ranking of fourth in the world. The following week, Spieth lost in a sudden-death playoff at the Shell Houston Open, having held the 54-hole lead. He shot a final round 70, but had to hole an 8-footer on the last to force the playoff following low rounds by J. B. Holmes and Johnson Wagner that had pushed them to the top of the leaderboard. On the first playoff hole, Spieth put his drive nearly into the water, and then followed up with a poor shot into the green-side bunker, causing his elimination from the playoff, which was won by Holmes. On April 9, Spieth shot an opening round 64 to finish the day eight strokes under par with a three-shot lead in the Masters Tournament at Augusta, Georgia; Spieth set a record as the youngest player to lead the Masters after the first round. His score was only one shot behind the course record of 63 shared by Nick Price and Greg Norman, with their rounds coming in 1986 and 1996 respectively. Spieth shot 66 the following day to break the 36-hole Masters scoring record by posting 14-under 130 through two rounds. The previous record, set by Raymond Floyd in 1976, was 13-under 131. He broke the 54-hole record at the Masters shooting a 16-under 200 through three rounds. During the final round Spieth briefly held a score of −19 but bogeyed the final hole resulting in him tying Tiger Woods' 1997 score record at 18-under. Spieth set the record for the most birdies during the Masters by making 28 and became the second-youngest person to win the Masters. His victory was the first wire-to-wire Masters win since Raymond Floyd's in 1976. The victory moved Spieth to #2 in the Official World Golf Ranking. On June 21, Spieth won the U.S. Open to claim his second major championship. He carded a one-under 69 in the final round to finish with a total of 275 (-5) and win the tournament by one stroke over Dustin Johnson and Louis Oosthuizen. Spieth had begun the day in a four-way tie for the lead and played in the penultimate group alongside Branden Grace. He opened his final round with a bogey to fall behind, but then a run 12 pars and two birdies in his next 14 holes moved him into a tie for the lead with Grace at five under par. On the 16th hole, Grace hit his tee shot out of bounds that led to a double bogey and Spieth capitalized by rolling in a lengthy birdie putt to create a three shot swing, which gave Spieth a three shot lead with two to play. However, on the 17th tee, Spieth pushed his tee shot well right into the thick rough, which led to a double bogey and coupled with Johnson's birdie on the 16th, the two were tied for the lead briefly. Spieth made birdie on the 18th to become the leader in the clubhouse. Johnson then had an eagle putt to win the tournament outright on the 72nd hole, but three-putted from 12 feet to finish one stroke behind. Spieth became only the sixth player ever to win the Masters and the U.S. Open in the same year, and the first since Tiger Woods in 2002. The other four golfers to accomplish this feat are Hall of Fame members Craig Wood, Ben Hogan, Arnold Palmer, and Jack Nicklaus. He became the fourth-youngest player to win multiple major championships and the youngest winner of the U.S. Open since Bobby Jones in 1923. The week before The Open Championship, Spieth chose to play at the John Deere Classic rather than the Aberdeen Asset Management Scottish Open, where many other top-ranked players were competing to prepare for the links style courses. Spieth shot the lowest round of his professional career to date, with a 61 in the 3rd round. He eventually won the tournament in a playoff with Tom Gillis after Gillis hit the ball in the pond on the 2nd playoff hole. Spieth earned his fourth victory of the year. His quest for the grand slam ended when he finished tied for 4th in The Open Championship with a final score of –14, one stroke out of a playoff. He had been tied for the lead but bogeyed the 17th hole to drop one stroke behind and could not make his birdie on the 18th to join the playoff. After finishing second behind Jason Day at the 2015 PGA Championship, he became the world number one in the Official World Golf Ranking. He was the 18th different golfer to earn the honor. He was number one for two weeks in August 2015 and one week in September. Spieth missed the cut in The Barclays and the Deutsche Bank Championship, the first two events of the FedEx Cup playoffs. However, his tied for 13th finish at the BMW Championship kept him second overall in the standings. Only needing a victory to clinch the championship, Spieth won the 2015 Tour Championship at East Lake Golf Club by four strokes. With the win, his fifth of the year, Spieth became the ninth FedEx Cup champion and earned a $10 million bonus for winning the Cup. Spieth won $12,030,485 (not including the $10 million bonus) in 2015, a PGA Tour record for a single year. He regained the world number one ranking. Spieth swept all the major awards for the season: PGA Player of the Year and PGA Tour Player of the Year (Jack Nicklaus Trophy), Vardon Trophy and Byron Nelson Award for leading the tour in scoring average, and Arnold Palmer Award for leading the tour's money list. Spieth started the year when he won the Hyundai Tournament of Champions with a dominant display that saw him race to an eight stroke victory over Patrick Reed. His score of −30 was not only a personal best, it was also only the second time a player reached −30 in a 72-hole PGA Tour event, after Ernie Els achieved the feat in 2003 at the same event. Spieth also matched Tiger Woods, by winning his seventh PGA Tour event before the age of 23. In April 2016, Spieth shot a bogey-free 66 during the first round of the Masters to open up a two shot lead over the field. He carded a two-over-par 74 during the second round, leading by one over Rory McIlroy entering the weekend. He led by one stroke after a third round 73. In the final round, after leading by five strokes heading into the back-nine, Spieth suffered one of the biggest collapses in Masters history, with many comparing it to the meltdown of Greg Norman at the 1996 Masters. [a] After bogeys at the 10th and 11th holes, Spieth hit two balls into the water at the par-3 12th hole, carding a quadruple-bogey and dropping him to a tie for fourth, three shots back. He finished second in the tournament, losing to Danny Willett by three strokes. Three-time Masters winner Nick Faldo, who won the 1996 tournament, said that Spieth's collapse "made Norman's feel like a joyful stroll down Magnolia Lane". On May 29, 2016, Spieth returned to the winner's circle for the first time since his Masters collapse when he won the Dean & DeLuca Invitational. He birdied six holes on the back nine on Sunday to see off the challenge of Harris English by three strokes. Spieth declined to be a member of the U.S. golf team at the 2016 Summer Olympics in Rio de Janeiro. Following a strong showing in the 2016 FedEx Cup Playoffs, Spieth played a prominent role on a victorious U.S. Ryder Cup Team. As the worlds #3 ranked player, behind Jason Day and Rory McIlroy, Spieth was looked upon as a leader within the American's locker room, illustrating both his maturity as a 23-year-old as well as the respect his peers have for him. In November, Spieth won the Emirates Australian Open on the PGA Tour of Australasia for the second time in three years, shooting a final round 69 to finish at −12, level with Australians Cameron Smith and Ashley Hall. Spieth claimed the title on the first playoff hole with a birdie, while Hall missed his birdie opportunity. The win was Spieth's 11th of his professional career and his third of 2016. Spieth began the year as defending champion at the SBS Tournament of Champions, but had to settle for a tie for third, six shots behind eventual winner Justin Thomas. The following week, at the Sony Open in Hawaii, Spieth again finished in third. Another top ten finish followed at the Waste Management Phoenix Open, to maintain Spieth's solid start to the year. On February 12, in his 100th PGA Tour tournament as a professional, Spieth picked up his first victory of the year at the AT&T Pebble Beach Pro-Am, finishing at −19. With this win, Spieth became just the second man, along with Tiger Woods, to win nine times on the PGA Tour before the age of 24, post-World War II. His next start saw him tied for 22nd at the Genesis Open, before finishing tied for 12th at the WGC-Mexico Championship. His next event was also a World Golf Championship event; the WGC-Dell Technologies Match Play. Spieth was seeded 5th, but failed to progress out of the pool stage; a surprise loss to Japan's 54th seed Hideto Tanihara (who would go on to reach the semi-finals) in his opening match, ultimately costing him. Spieth's first missed cut of the year came a week later at the Shell Houston Open. In his fourth appearance at the Masters, Spieth finished tied for 11th. This was the first time that he had failed to finish either first or second in the opening major of the year. Spieth entered the final round just two shots off the lead, but a 3-over-par 75 on Sunday put pay to his hopes of a second Green Jacket. After finishing 4th alongside Ryan Palmer at the Zurich Classic, Spieth missed consecutive cuts at the Players Championship (his third successive missed cut at golf's unofficial "Fifth Major") and the AT&T Byron Nelson. A return to form came at the Dean & DeLuca Invitational, where Spieth just missed out on successfully defending his title, finishing a shot behind eventual winner Kevin Kisner. A solid if unspectacular tie for 13th followed at The Memorial Tournament, his final start before the U.S. Open. Spieth arrived at Erin Hills for the U.S. Open looking for a second victory at golf's second major in three years and a third major title overall. With big names, including the world's top-three (defending champion and world no. 1 Dustin Johnson, world no. 2 Rory McIlroy and world no. 3 Jason Day) all failing to make the cut, Spieth did manage to do so and with just eight shots covering all the players who made the weekend, it was anyone's title to win. For Spieth however, a 4-over-par 76 on Saturday put pay to any chances and he eventually finished at one-over-par for the tournament and in a tie for 35th. The following week, Spieth made his debut at the Travelers Championship and began with a 7-under-par 63 to lead after the first round and kept his advantage heading into the final round. He ended the tournament at −12, along with Daniel Berger, who was seeking his second victory in three weeks. Spieth holed out from a greenside bunker for birdie on the first playoff hole to take his 10th PGA Tour title, just over a month shy of his 24th birthday. On July 23, Spieth won the Open Championship at Royal Birkdale, giving him his third major title. Spieth tied for the lead after a first-round 65 and held the lead outright after the second and third rounds, leaving him three shots clear of Matt Kuchar heading into the final day. However, that lead was lost after three bogeys in his opening four holes of the final round. Kuchar took the lead with five holes remaining after Spieth drove his ball 100 yards to the right of the fairway on the par-4 13th, leaving him with an unplayable lie and needing to take a drop for a one stroke penalty; Spieth limited the damage by striping a 3-iron from the practice range area and making bogey, leaving him just a shot behind Kuchar. In a show of good sportsmanship, Spieth apologized to Kuchar for the 21-minute delay to sort out his wayward tee shot. Spieth's response to that wobble saw him nearly holing his tee shot at 14 (where he would make birdie), draining a 35-foot putt for an eagle at 15, and carding birdies at 16 and 17. Spieth finished with a final round 69 — three strokes clear of Kuchar, who also carded a 69 – and became just the second player in history after Jack Nicklaus to win three of the four men's golf majors before his 24th birthday. Spieth later gifted the 3-iron from that shot on the 13th hole back to Royal Birkdale. After finishing in a tie for 13th at the WGC-Bridgestone Invitational, Spieth headed to the final major of the year, the PGA Championship, with the opportunity to become just the sixth man in history, to win the career grand slam. However, he would only finish in a tie for 28th; this was his one and only opportunity to be the youngest to complete this feat. Spieth finished second in the first FedEx Cup Playoff event at The Northern Trust, losing to world no. 1 Dustin Johnson in a playoff. Spieth had been leading by three strokes heading into the final round, and was five shots clear after five holes on Sunday. However, his tee shot found the water at the par-3 6th (where he made double bogey) and Johnson pulled level at the 10th. A clutch par putt at the 17th meant the two men were level heading to the 72nd and final hole of regular play. Spieth appeared to have the advantage after he lagged a 70-foot putt to within a few feet, while Johnson needed to make a 20-footer for par (after pulling his tee shot into the rough) to force a playoff. Johnson made the putt, and then on the first playoff hole (also at 18), Johnson carried the lake and wedged to within a few feet. Spieth found the fringe on the back of the green, but could not make the birdie he needed, missing out on his fourth win of the year, and in the process, seeing Johnson take his fourth title of the season. Another runner-up finish would follow the next week at the Dell Technologies Championship, finishing three shots behind Justin Thomas, who took his fifth victory of the season. Spieth would then finish in a tie for 7th at the BMW Championship. Spieth headed into the season-ending Tour Championship at East Lake knowing victory would guarantee him his second FedEx Cup title in three years. He would finish for the second consecutive week in a tie for 7th, which proved not to be enough, as Thomas finished runner-up to Xander Schauffele, to take the season-long title and the $10m prize, as well as the 2017 PGA Tour Player of the Year. Spieth did take the Vardon Trophy and Byron Nelson Award for the second time in his career for leading the tour in scoring average. A third Presidents Cup victory would follow, as Spieth was part of the United States team which comfortably defended their title. Following a near two-month break, Spieth headed to Australia looking for a third Australian Open title in four years, but was never really in contention to defend his title, although a final round 67 (his best round of the tournament) meant he finished in 8th. 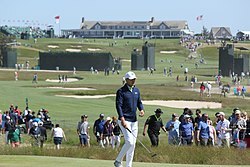 Spieth at Shinnecock Hills Golf Club for the 2018 U.S. Open. For the second consecutive year, Spieth began his season by competing in both tournaments during the Hawaii swing, finishing 9th at the Sentry Tournament of Champions and in a tie for 18th at the Sony Open in Hawaii (he would make the longest putt of his career (90'8") during the second round), before missing the cut at the Phoenix Open and finishing in a tie for 20th as the defending champion at the AT&T Pebble Beach Pro-Am. In February, Spieth was announced as the PGA Tour's Chairman of the Player Advisory Council, succeeding Davis Love III. The 16-member panel consults with the PGA Tour's Policy Board and commissioner Jay Monahan on issues affecting the tour; Spieth will serve a three-year term (2019–2021). On the course, Spieth had been having struggles with his trusty putter at the beginning of the year, but a tie for 9th at the Genesis Open left him feeling optimistic about his game: 'I putted extremely well this week, which is awesome. I feel great about the state of my game going forward. I feel like I'm in a great place at this time of the year as we're starting to head into major season.' A tie for 14th would follow at the WGC-Mexico Championship. A month away from the Masters Tournament, Spieth was hoping to kick-start his season at the Valspar Championship, where he was victorious in 2015, which led on to his magnificent year with his win at Augusta, as well as the U.S. Open. However, Spieth's difficult campaign continued, missing the cut at +5. His next start at the WGC Match Play saw him seeded 4th. He was victorious over Charl Schwartzel and Li Haotong, but was defeated by Ryder Cup playing partner Patrick Reed in their winner-takes-all final match, which meant Spieth failed to progress out of the group stage. In his final event before Augusta, Spieth finished in a tie for 3rd at the Houston Open. Spieth began the Masters with a six-under par round of 66 (including five consecutive birdies through holes 13–17), giving him a two-shot lead, meaning for the third time in four years, he would lead the opening major of the year after the first round. Entering the final round at −5, he was nine strokes behind leader Patrick Reed. He tied the best final round score in Masters history, shooting an 8-under 64. He missed a par putt on the 18th hole to tie the tournament record score (63, −9). He finished at −13, in third place, two strokes behind the champion Reed. In his first start after Augusta, Spieth, playing alongside Ryan Palmer at the Zurich Classic of New Orleans, missed the cut. For the first time since his debut at the event in 2014, Spieth made the cut at The Players Championship and shot a personal best round of 65 during the third round, leaving him on course for a possible top-10 finish. However, a 2-over-par final round of 74 (including a quadruple bogey on the 72nd hole) left him at −6 for the tournament and in a tie for 41st. A tie for 21st at the AT&T Byron Nelson and a tie for 32nd at the Fort Worth Invitational would follow. In his final start before the U.S. Open, Spieth would miss the cut at the Memorial Tournament. Spieth missed the cut at the U.S. Open by a shot, the first time he had not made the cut at a major championship since the 2014 PGA Championship. The following week, Spieth began the defense of his Travelers Championship title with a 7−under−par round of 63, which included 6 birdies and an eagle. He couldn't replicate that form for the rest of the tournament, and finished in a tie for 42nd at −4. After a month off from competition, Spieth's next start came at The Open at Carnoustie, where he was the defending champion and looking for his first win since his third major title a year earlier. He was seeking to join Tiger Woods, Bobby Jones and Young Tom Morris as the only players to have won at least four majors before age 25. His defense began with a 1-over-par round of 72, but he moved into contention over the next couple of days, with a bogey-free Saturday round of 65 moving him into a tie for the lead with fellow Americans Xander Schauffele and Kevin Kisner. However, Spieth shot 76 on Sunday, with no birdies on his card, tumbling into a tie for ninth at −4, finishing four shots behind the champion Francesco Molinari. Spieth would finish in a tie for 60th in his next start at the WGC-Bridgestone Invitational, before a second attempt to complete the career grand slam at the PGA Championship saw him finish in a tie for 12th. During the FedEx Cup Playoffs, Spieth finished in a tie for 25th at The Northern Trust, before a tied 12th finish at the Dell Technologies Championship. A tie for 55th finish at the BMW Championship left Spieth 31st in the FedEx Cup standings. With only the top-30 qualifying for the Tour Championship, it meant for the first time in his career, Spieth would miss the final event of the season, leaving him without a victory in the 2017–18 season. Spieth played in all five sessions of the Ryder Cup, collecting three points alongside Justin Thomas, but Europe would regain the trophy in Paris. In his first start of the 2018-19 PGA Tour season, Spieth finished tied 55th at the Shriners Hospitals for Children Open. He would then miss the cut at the Mayakoba Golf Classic, meaning for the first time in his professional career, Spieth had gone an entire calendar year without a victory worldwide. Spieth began 2019 by missing the cut by a shot at the Sony Open in Hawaii, before finishing in a tie for 35th at the Farmers Insurance Open. A tie for 45th followed at the AT&T Pebble Beach Pro-Am; Spieth had been a shot off the lead at the halfway point, but over-par rounds over the weekend saw him fall down the leaderboard. In February 2019, Spieth entered the final round of the Genesis Open in a tie for fourth. However, brisk conditions and gusty winds left him with a final round 81. His scorecard featured a double bogey on No. 2, a triple bogey on No. 5 where he three-putted from 4 feet and a quadruple-bogey 8 on the treacherous 10th hole after nearly driving the green. A tie for 54th followed at the WGC-Mexico Championship. For the fourth time in five years, Spieth missed the cut at the Players Championship, before exiting in the round robin stages at the WGC-Dell Technologies Match Play and then finishing in a tie for 30th at the Valero Texas Open. His sixth appearance at The Masters saw Spieth's worst finish at Augusta, a tie for 21st at five under par. Spieth is the son of Shawn and Christine Spieth, both natives of Pennsylvania. His grandfather, Donald Spieth, is a music teacher at Moravian College and Northampton Community College in Bethlehem, Pennsylvania, where he was a long-time conductor of the former Lehigh Valley Chamber Orchestra. Jordan has two younger siblings, Steven and Ellie. Steven played college basketball and played for the Dallas Mavericks 2017 NBA Summer League team. Ellie has grown up with disabilities, and Jordan has credited her with "keeping him grounded and focused as well as keeping the game of golf in perspective." On January 2, 2018, Spieth confirmed his engagement to long-time girlfriend, Annie Verret. The two married in November 2018 in Dallas. After earning a spot on the 2013 Presidents Cup team, Spieth began to plan the Jordan Spieth Family Foundation. Spieth's younger sister Ellie was part of the inspiration, and through his work, the Foundation provides awareness and financial assistance to community organizations within four philanthropic pillars: special needs children, military families, junior golf and pediatric cancer. ^ a b "Jordan Spieth closes with 1-under 69 to capture FedEx Cup, $10M bonus". ESPN. Associated Press. September 28, 2015. ^ Gittings, Paul (June 22, 2015). "U.S. Open 2015: Jordan Spieth claims back-to-back majors in dramatic finale". CNN. ^ Corrigan, James; Bagchi, Rob (July 23, 2017). "Jordan Spieth turns potential Open meltdown into extraordinary victory at Royal Birkdale". The Telegraph. Retrieved July 27, 2017. ^ "Jordan Spieth biography". Encyclopedia Britannica. Retrieved August 1, 2017. ^ "Jordan Spieth profile". PGA Tour. Retrieved April 12, 2015. ^ "Whicker: Jordan Spieth is still the kid next door". The Salt Lake Tribune. April 24, 2015. Retrieved June 23, 2015. ^ Kerr-Dineen, Luke (April 13, 2014). "5 things you can learn about Jordan Spieth from this Golf World profile". Golf Digest. Retrieved November 1, 2017. ^ Doyle, Justin. "Jordan Spieth – Biography & Facts". Encyclopedia Britannica. Retrieved July 27, 2017. ^ "Polo Boys Golf Rankings". Polo Golf Rankings. Polo Golf. July 20, 2011. Retrieved July 23, 2011. ^ "34th Junior PGA Championship". PGA of America. July 31, 2009. Retrieved July 23, 2011. ^ "All-Time Rolex Junior Players of the Year". American Junior Golf Association. Retrieved July 23, 2011. ^ a b Durrett, Richard (January 25, 2010). "Spieth, 16, to play in HP Byron Nelson". ESPN. Retrieved July 23, 2011. ^ Townsend, Brad (May 22, 2010). "Dallas teen Jordan Spieth becomes sixth-youngest golfer to make cut in PGA Tour event". The Dallas Morning News. Retrieved July 23, 2011. ^ "What will Spieth do for an encore?". PGA Tour. May 25, 2011. Archived from the original on March 23, 2012. Retrieved July 23, 2011. ^ a b "Jordan Spieth - Seasons". PGA Tour. Retrieved July 16, 2013. ^ "Texas Longhorns player bio for Spieth". University of Texas at Austin. Archived from the original on December 14, 2012. Retrieved January 12, 2011. ^ "Walker Cup - 2011". USGA.org. September 11, 2011. Archived from the original on January 3, 2012. Retrieved September 11, 2011. ^ "2011–12 University of Texas Men's Golf Statistics" (PDF). Retrieved June 14, 2012. ^ a b "Men's Golf freshman All-American Jordan Spieth to appear in first major at U.S. Open". June 12, 2012. Retrieved June 14, 2012. ^ "Division I PING First-Team All-Americans Announced". May 31, 2012. Retrieved June 14, 2012. ^ Evans, Farrell (June 17, 2012). "Jordan Spieth low amateur". ESPN. Retrieved June 18, 2012. ^ "Jordan Spieth moves to world number one on WAGR". World Amateur Golf Ranking. June 2012. Retrieved June 21, 2012. ^ "Spieth fails to advance to Q-School finals". Golf Week. November 17, 2012. Retrieved December 13, 2017. ^ Nichols, Bill (December 14, 2012). "Dallas golfer Jordan Spieth to leave Longhorns to turn pro". The Dallas Morning News. Retrieved December 17, 2012. ^ Scott, Trey (January 14, 2013). "Under Armour signs former Longhorn golfer Jordan Spieth". The Dallas Morning News. Retrieved January 14, 2013. ^ Harig, Bob (March 18, 2013). "Jordan Spieth exempt after T-7". ESPN. Retrieved March 18, 2013. ^ "Jordan Spieth, 19, takes John Deere". ESPN. July 14, 2013. Retrieved July 16, 2013. ^ Brown, Rick (July 14, 2013). "19-year-old Jordan Spieth wins John Deere Classic". USA Today. Retrieved July 16, 2013. ^ "Week 28: Mickelson Takes World No. 5 and 19 Year Old Jordan Spieth Bags Himself A Ticket Into The Open Championship". OWGR. July 15, 2013. Retrieved July 16, 2013. ^ "Reed beats Spieth in playoff at Wyndham Championship". USA Today. Associated Press. August 18, 2013. Retrieved November 2, 2018. ^ "SuperStroke signs Jordan Spieth as global ambassador for brand". WorldGolf.com. January 31, 2014. Retrieved April 12, 2015. ^ Hodgetts, Rob (April 13, 2014). "Masters 2014: Bubba Watson wins second Green Jacket at Augusta". BBC Sport. ^ Shemilt, Stephan; Henson, Mike (April 13, 2014). "The Masters day four as it happened". BBC Sport. ^ "After runner-up finish at the Masters, Jordan Spieth becomes youngest American to crack the Top 10 in the world rankings". Golf.com. Associated Press. Retrieved March 18, 2015. ^ Brown, Oliver (September 20, 2014). "Ryder Cup 2014: Jordan Spieth can be Team USA captain Tom Watson's ace against Europe at Gleneagles". The Daily Telegraph. London. Retrieved September 27, 2015. ^ "Jordan Spieth upstages Rory McIlroy and Adam Scott to win Australian Open". The Guardian. London, UK. Reuters. November 30, 2014. ^ "Jordan Spieth: Tiger Woods tied last as youngster wins in Florida". BBC Sport. December 7, 2014. ^ "Spieth wins Valspar Championship in playoff". PGA Tour. Associated Press. March 15, 2015. ^ "Week 11: Spieth Reaches Career High Of World No. 6". OWGR. March 16, 2015. ^ LaFontaine, Cameron (April 5, 2015). "PGA Tour: J.B. Holmes wins Shell Houston Open over Jordan Spieth, Johnson Wagner". Fansided.com. Retrieved April 12, 2015. ^ "Spieth youngest to lead Masters after Round 1". PGA Tour. Associated Press. April 9, 2015. ^ Corrigan, James (April 9, 2015). "Jordan Spieth's first-round charge puts Rory McIlroy and Tiger Woods in the shade". The Daily Telegraph. London, UK. Retrieved April 10, 2015. ^ Porter, Kyle. "Jordan Spieth shoots 66 in round 2; is dominating 2015 Masters". CBS Sports. Retrieved April 11, 2015. ^ Ferguson, Doug (April 12, 2015). "Jordan Spieth, 21, captures Masters victory for the ages". MSN. Associated Press. Retrieved April 12, 2015. ^ Porter, Kyle. "Jordan Spieth (-18) ties Tiger's scoring record, wins 2015 Masters". CBS Sports. Retrieved April 13, 2015. ^ Corrigan, James (April 12, 2015). "Jordan Spieth marches to first Masters title with imperious display". The Daily Telegraph. London, UK. Retrieved April 13, 2015. ^ "Week 15: Spieth Claims His First Major Title". OWGR.com. April 13, 2015. ^ DiMeglio, Steve (June 22, 2015). "Jordan Spieth cool under pressure, wins U.S. Open by one". USA Today. Retrieved June 22, 2015. ^ "Jordan Spieth wins historic title for second major". BBC Sport. June 22, 2015. Retrieved June 22, 2015. ^ Crouse, Karen (June 22, 2015). "U.S. Open 2015: Jordan Spieth, Not Yet 22, Is 2 for 2 in This Year's Majors". The New York Times. Retrieved June 22, 2015. ^ Borden, Sam (July 14, 2015). "For Rickie Fowler and Jordan Spieth, Opposite Approaches to British Open". The New York Times. ^ "John Deere Classic: Jordan Spieth takes lead in Open warm-up". BBC Sport. July 12, 2015. ^ "Johnson's win makes him unique; Spieth misses history test". ESPN. July 20, 2015. Retrieved July 21, 2015. ^ "Spieth named PGA Tour Player of the Year: Daniel Berger is selected as the Tour's top rookie". PGA Tour. October 2, 2015. ^ "Jordan Spieth wins Tournament of Champions". BBC Sport. January 11, 2016. ^ a b Greenstein, Teddy (April 10, 2016). "A Norman-esque collapse leaves Jordan Spieth reeling". Chicago Tribune. Retrieved April 11, 2016. ^ Brennan, Christine (April 11, 2016). "Brennan: Jordan Spieth's collapse is one we won't soon forget". USA Today. Retrieved April 10, 2016. ^ Strege, John (April 11, 2016). "Jordan Spieth's 12th-hole collapse: 'Nothing…harder on the eyes' in golf history". Golf Digest. Retrieved April 11, 2016. ^ Plaschke, Bill (April 10, 2016). "Trying to play it safe, Jordan Spieth plays his way into a historic collapse at the Masters". Los Angeles Times. Retrieved April 11, 2016. ^ Weinreb, Michael (April 11, 2016). "The Agony of Jordan Spieth: Can He Recover From His Masters Collapse?". Rolling Stone. Retrieved April 11, 2016. ^ Bort, Ryan (April 11, 2016). "Where Does Jordan Spieth's Masters Collapse Rank?". Newsweek. USA Today Sports via Reuters. Retrieved April 11, 2016. ^ "The Latest: Willett wins the Masters after Spieth collapses". USA Today. Associated Press. April 10, 2016. ^ O'Connor, Ian (April 11, 2016). "Jordan Spieth's collapse at the Masters the most shocking in golf history". ESPN. Retrieved April 11, 2016. ^ Inglis, Martin (May 30, 2016). "Jordan Spieth silences doubters at Colonial". bunkered. ^ Harig, Bob (July 11, 2016). "Jordan Spieth says he won't compete in Rio Olympics". ESPN. ^ "Pebble Beach Pro-Am: Jordan Spieth wins his ninth PGA Tour title". BBC Sport. February 13, 2017. Retrieved July 24, 2017. ^ "Travelers Championship: Jordan Spieth wins after play-off". BBC Sport. June 25, 2017. Retrieved July 24, 2017. ^ McAllister, Mike (July 23, 2017). "Spieth exorcises major demon, inches closer to history". PGA Tour. ^ Davis, Matt (July 21, 2017). "The Open 2017: Jordan Spieth holds off Matt Kuchar to win third major". BBC Sport. Retrieved July 24, 2017. ^ Inglis, Martin (October 19, 2017). "Jordan Spieth gifts Open 3-iron to Royal Birkdale". bunkered. ^ Gray, Will (February 18, 2018). "Spieth: 'I feel great about the state of my game'". Golf Channel. ^ Wacker, Brian (July 22, 2018). "British Open 2018: Where did it go wrong for Jordan Spieth on Sunday?". Golf Digest. ^ Gray, Will (February 17, 2019). "Jordan Spieth plummets with closing 81 at the Genesis Open". Golf Channel. ^ Crouse, Karen (November 26, 2015). "A Spieth Who Doesn't Live in His Brother's Shadow, at Least at Home". The New York Times. Retrieved March 15, 2016. ^ "Jordan Spieth's biggest fan: His grandfather, from Bethlehem". Lehigh Valley Live. April 14, 2014. Retrieved June 23, 2015. ^ Nichols, Beth Ann (April 12, 2014). "Spieth, 20, strives for normalcy as star status rises". Golfweek. ^ "Newsmakers of the Year - No. 9: Jordan Spieth". Golf World. December 2013. ^ "Golf's Golden Dropout". The New York Times. Retrieved June 22, 2015. ^ Speros, Bill (January 2, 2018). "It's official: Jordan Spieth confirms engagement to Annie Verret". Golfweek. ^ "Jordan Spieth Family Foundation". Retrieved April 14, 2015. ^ "2013 Money Leaders". PGA Tour. Retrieved July 24, 2017. ^ "2013 Scoring Average". PGA Tour. Retrieved December 21, 2017. ^ "2014 Money Leaders". PGA Tour. Retrieved July 24, 2017. ^ "2014 Scoring Average". PGA Tour. Retrieved December 21, 2017. ^ "2015 Money Leaders". PGA Tour. Retrieved July 24, 2017. ^ "2015 Scoring Average". PGA Tour. Retrieved December 21, 2017. ^ "2016 Money Leaders". PGA Tour. Retrieved July 24, 2017. ^ "2016 Scoring Average". PGA Tour. Retrieved December 21, 2017. ^ "2018 Money Leaders". PGA Tour. Retrieved September 25, 2018. ^ "Career Money Leaders". PGA Tour. Retrieved September 25, 2018. ^ "Jordan Spieth Profile". PGA Tour. Retrieved September 25, 2018. Wikimedia Commons has media related to Jordan Spieth.